Probiotics and prebiotics can both help to improve digestion and overall health. The National Center for Complementary and Alternative Medicine (NCCAM) explains that prebiotics are food ingredients that cannot be digested, but instead, stimulate the growth of probiotics. Probiotics are microorganisms like bacteria that live in the gut, aiding digestion and immunity. The NCCAM says that probiotics can promote a balance in the body, reduce gastrointestinal problems like diarrhea and even reduce yeast infections. The NCCAM says that yogurt is one food that naturally contains probiotics. Some yogurts have more probiotics added. The most common bacterium that makes up probiotics in yogurt is lactobacillus acidophilus and bifidobacterium bifidum, according to the NCCAM. Some yogurts are even labeled with the number of live, active cultures of probiotics they contain. For digestive benefits, the more probiotics a product has, the greater the benefits of using the product are. The NCCAM says that soy beverages like soy milk contain probiotics that are added during processing. Julie Lanford, a registered dietitian who specializes in cancer and the immune system, explains that if a product states it contains “live and active cultures,” that it has probiotics. People who drink soy milk often drink it instead of cow’s milk because they are lactose-intolerant. The "American Journal of Clinical Nutrition" states that consuming probiotics may actually improve the digestion of lactose in people who are lactose-intolerant. 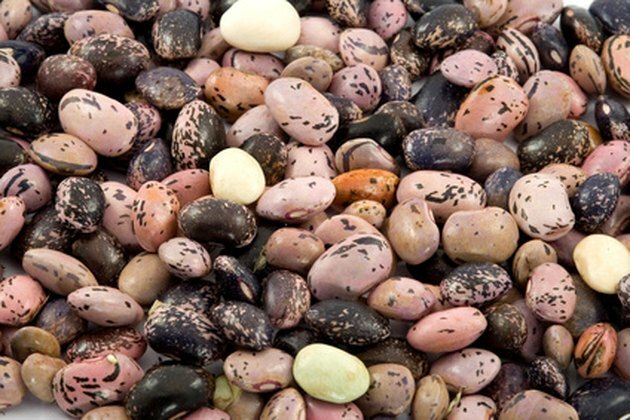 While legumes, such as lentils, black beans, kidney beans and chickpeas, do not contain probiotics, they do contain prebiotics, according to Lanford, known as the "Cancer Dietitian." These prebiotics promote the growth of the natural bacteria in your gut. Some prebiotic ingredients found in legumes include fructo-oligosaccharides and arabinogalactan, which are both rich in dietary fiber. People with digestive problems may benefit from getting more legumes in their diet. Whole grains, like oats and oatmeal, also contain prebiotics, according to Lanford. She also says that when a food containing prebiotics, like oatmeal, is eaten at the same time as a food containing probiotics, like soy milk, or a supplement with probiotics, the two work together to enhance the benefits of the healthy bacteria in your gut. Can Probiotics Cause Stomach Pain?